Renelle and Toney were high school sweethearts, dating on and off for over 10 years, while she went to college and he served in the army. One day at her house Tony was visibly nervous and had just gotten off the phone with her parents. It turns out he had just asked their permission to propose, Renelle said, “He said all this sweet stuff and got down on one knee”. She had a feeling something was going on, but it still took her by surprise. The couple considered a destination wedding from the start, and Toney was game for whatever Renelle wanted. 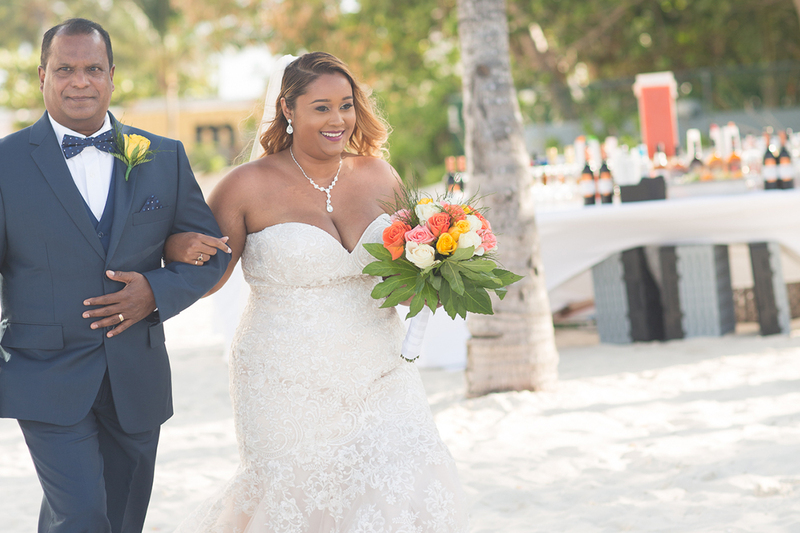 She is originally from Trinidad, and hosting a Caribbean wedding sounded like the easiest way for more of her family to attend. Renelle’s sister found Destify, and their agent, Jordan. After talking to her they felt at ease and knew it was the right choice. One of Renelle’s favorite Caribbean islands is the Bahamas, and they chose the Melia Nassau Beach resort because it was elegant, newer and modern. Diane, the on property wedding coordinator and Neishar from Legacy event planning made the wedding processes completely smooth. Helping Renelle every step of the way. The couple chose to build their own ceremony, opting for all the bells and whistles, including additional decor. On the day of their wedding, Renelle took over the room and got ready with her girls while taking time to hang with them for breakfast and lunch. Renelle said, “The entire day was very relaxing”. Toney and the groomsmen spent the day together and made time to hit the beach. They held a sunset ceremony at 6pm, on Melia’s beautiful beachfront. Although there were hiccups throughout the day the couple both let everything come as it may, and the ceremony proved to be perfect. Afterward, they held a cocktail hour and reception, with delicious food and a DJ. Over 60 guests attended, a large number for a destination wedding, and everyone had an amazing time together. The couples advice is to not stress out on your big day. Things may go wrong, but they kept a positive attitude throughout, which made everything that much more enjoyable. Renelle advises future couples to stop to soak it all in because the day goes so quickly. I just let everything roll off my shoulders, and at the end of the night it was perfect, it was everything we could have asked for!